We decided not to take G to Urgent Care. Instead we called Florida, where J’s step-sister and brother-in-law have the fabulous qualifications of a) being nurses, b) also having a toddler, c) having already raised a child up to college age (ie, previous parenting success!). My brother-in-law talked us through some best and worst-case scenarios and agreed that since G was eating a bit, talking and even playing, it just couldn’t be that dire a situation. Sure enough, the acetaminophen kicked in and her fever was soon in the 104 range and within an hour was at 102.8. It seemed best at that point for us all to get as much sleep as possible and call the doctor in the morning. G fell into a solid sleep at 2 a.m. and woke at 7 shivering but with a normal temp. An hour later, however, 99 F had climbed back to 104. She gagged on the acetaminophen, and vomited all the water she’d just drunk. Luckily, I had just put on one of J’s shirts. I spoke to the pediatrician at 8:30 and she asked us to bring G by around noon. We’ve come to expect this timeline from the doctor. She books regular appointments in the morning and holds drop-in hours in the afternoon. Almost everything in Italy shuts down for a two- or three-hour lunch, the doctor’s office included, but our pediatrician has serious and more infectious cases come by at noon when there’s little wait and no other patients to expose. Just in case G was contagious (we were still secretly holding out for chickenpox), J and I decided that walking to the doctor was best. It was sunny but cold, so I bundled G in her snowsuit and met J at the Faculty of Science for a 45-minute stroll to downtown. We love this walk. When the weather is nice, it’s our favorite way to get to Trento. It’s shaded and cool in the summer and sunny in the winter. We passed a horse grazing in a vineyard and stopped for G to say hello. At noon exactly we buzzed ourselves into a dark stone hallway, parked the stroller and headed upstairs to the doctor’s office. Some other day I’ll describe the 300-year old building, the husband-wife pediatric team, the complete disorder when the room is packed with anxious parents vying to get their kid seen first, and the chairs that scream socialized medicine (boo!) while the care itself shouts socialized medicine (yay!). What medically seems to be going on is this: probably sinusitis. G had a cold or allergies last week, and some mucus is backed up in her ear canal so even more might be crowding her adenoids. Her throat is only slightly red and swollen while her urine is a-okay, ruling out strep throat or a UTI. This honestly caught us by surprise because she hasn’t been coughing and her nose isn’t running. In other words, she’s so stuffed up that we couldn’t tell she was stuffed up! Now here’s where we encountered the striking difference between American and Italian medical practices: our toddler has had a fever near 104 for two full days and the doctor did not prescribe an antibiotic. Instead, she prescribed various drops that get inhaled through a nebulizer as a way to clear the nasal passages of clogged mucus. “Let’s see if her immune system can handle this,” the doctor said. “It’s really better that way.” I nodded. I even agree! American medicine is too free with antibiotics and shies away from less aggressive or homeopathic treatments. I’m allergic to several kinds of antibiotics and that’s a real problem. I want my daughter to have a strong immune system that can fight its own battles. However, one part of me was incredulous, even annoyed. I walked 45 minutes to the doctor’s office and didn’t leave with an antibiotic? I’m sure in two days the symptoms will just be worse and the doctor will recommend the antibiotic, I thought. Why are we wasting two days of potential healing? And finally I raged—still internally, thank goodness—that my daughter is not a Jane Austen character and while my ancestors may have survived Victorian times, how wise is it, really, in 2011 to resort to cold compresses and letter-writing to get through an illness? Class-A drugs like antibiotics are no-cost through the Italian National Health System and require a special form for processing. The Dr. gave us the red antibiotic slip, a paper designed to imply danger or warning, but told us NOT to fill it. In a few days, we should call to discuss G’s progress and only then will she recommend (or not) the antibiotic. 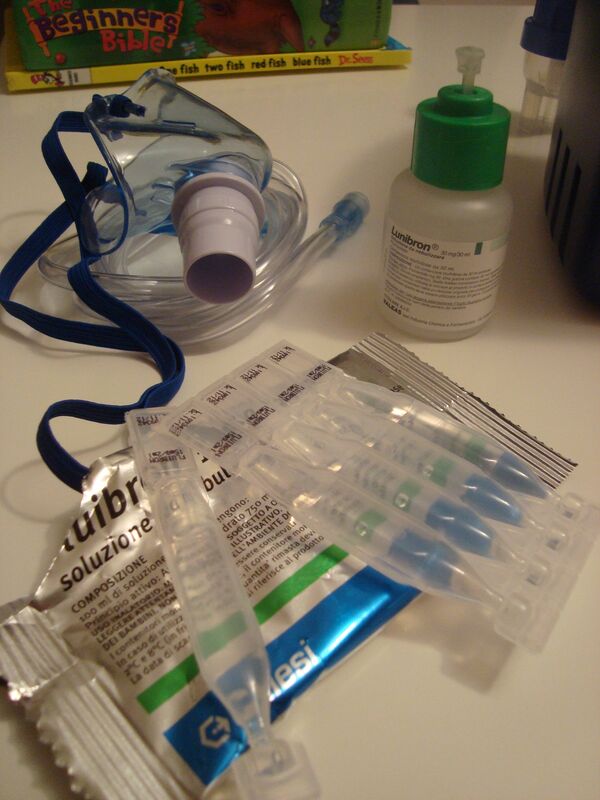 Everything was closed for the three-hour lunch, so we went to the pharmacy in the evening and returned home with a nebulizer unit and two liquid medicines. I have no idea what the drops are. One is called Lunibron and the other Fluibron. Neither are available in the States, nor could I find a U.K. site describing them. The gist is obvious, though: they’re decongestants. The idea is that by turning the drops into a vapor, the medicine directly targets the airway. This is supposed to be a more efficient and effective treatment than ingesting a pill. The obvious negative is now we’ve got this large piece of equipment to care for. It takes time to set up and prepare the drops, and the small pieces and face mask must be sanitized (five minutes in boiling water) after each use. And the treatment takes time. The whole “nebulizing” trick starts right away, but a single treatment will last 10 to 15 minutes while all the drops turn to vapor for inhalation. Can you imagine getting a toddler to sit still with a mask on her face to breathe vapors for a quarter-hour? Once we had the apparatus set up and the drops and our daughter in place, it was time to turn on the machine. We shared an incredulous look. Seriously? This is the best that medicine has to offer? I confess I was tempted to run back to the pharmacy with my red antibiotic form. G loves the strawberry flavor of Augmentin. We pushed the green button. Vapor puffed from the mask. G held the mask to her own face and inhaled, leaning against her father’s shoulder and cradling a teddy bear in one arm. Unbelievable. Interesting point: The pediatrician said that when a fever gets really high, she’s heard that American doctors “a few years back” would recommend “cooling baths.” In her opinion, while this may lower the fever, it’s also likely to exacerbate the underlying cause (sort of like, “don’t go out with wet hair because you’ll catch cold”). She recommends stripping the baby to her diaper and using a cotton ball to apply rubbing alcohol to the bare skin for about 20 minutes. Fascinating cultural disagreement, no? We don’t have any rubbing alcohol in the house, and I don’t think Amaretto is a viable substitute (would smell good, though…) so we’ll be sticking with those cooling baths for now. Better yet, hopefully our new nebulizer does the trick and we won’t be in that position again for a long, long time. This entry was posted in Uncategorized and tagged Cultural Differences, Expat Life, Italian Medical Care. Bookmark the permalink. Hope G is feeling better!